Based in Denver, Parker Bowles has been a wellness writer since 2006. Her work has appeared in "Yoga Journal," "Elephant Journal" and "CafeWell." Bowles holds a Bachelor of Science in biology with a concentration in nutrition from the College of William and Mary and a Master of Science in kinesiology from King's College. She is also a certified health coach with a certificate in holistic health and nutrition from the Institute for Integrative Nutrition. 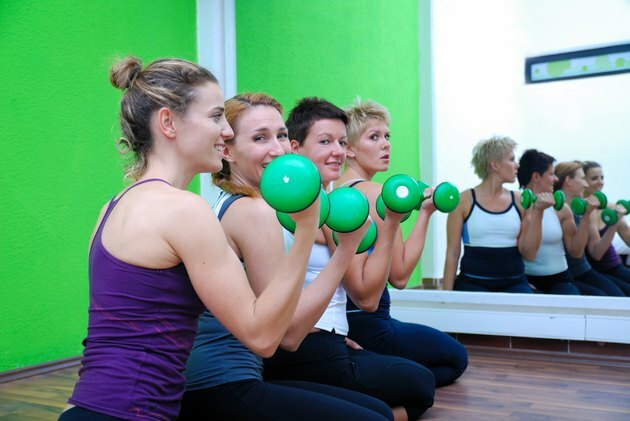 Many exercisers, especially women, are hesitant to do too many arm exercises for fear of gaining bulky muscle mass. If you want to have toned, trim arms without the bodybuilder look, high-repetition, low-weight resistance exercises are the key. 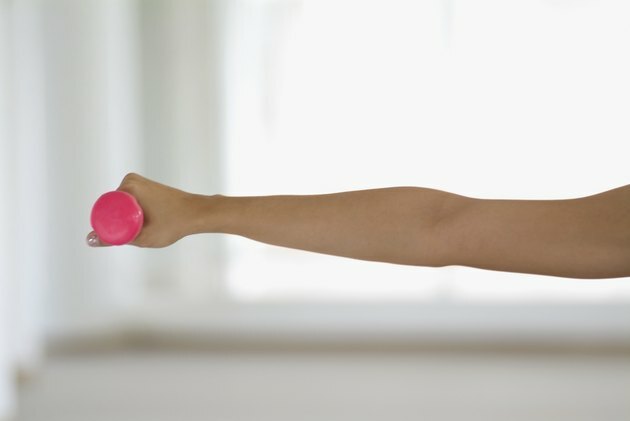 There are several exercises that tone but don't bulk up each part of your arm if you use low-weight rather than heavier dumbbells. Select your weights. 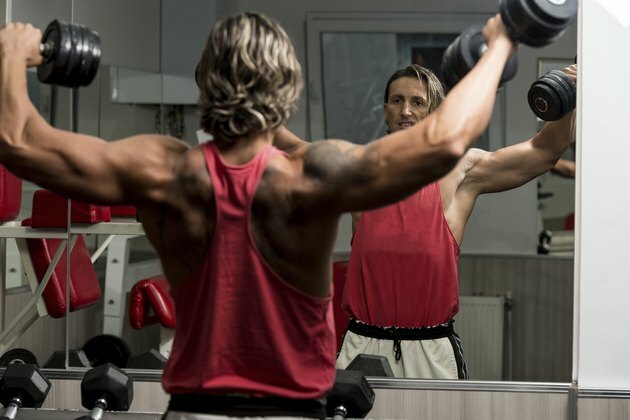 Choose weights that are heavy enough to be challenging, but light enough that you can do 15 to 20 curls on each side and still feel able to do at least five more. Lightly grip the dumbbells in each hand. Let your arms hang by your sides, elbows straight and palms facing in. 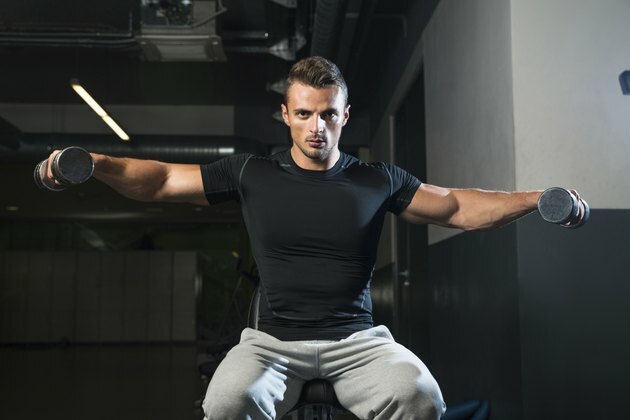 Raise your right arm slowly, rotating your forearm as you lift. 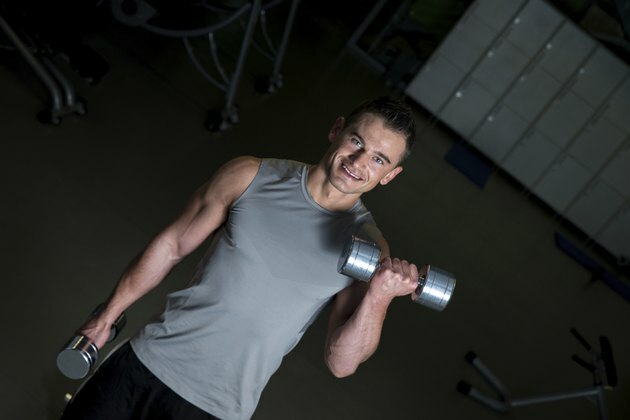 Your forearm begins the exercise facing your hip, but as you lift, it should begin to turn clockwise until it meets your biceps. Your palm should be facing your shoulder. Lower your right arm to its original position. Repeat on the left side. Continue to alternate between right and left sides. Aim for 15 to 20 repetitions on each side. Rest for about one minute and repeat the exercise. 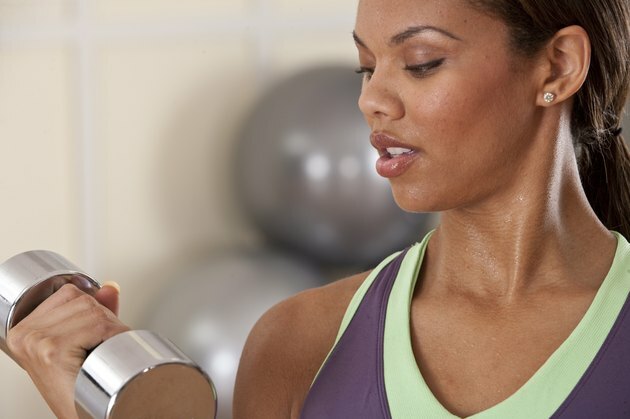 Aim for three sets of 15 to 20 repetitions on each side twice a week to tone your biceps. Select weights that are heavy enough to challenge you but light enough that you can execute at least 10 to 15 repetitions with the capacity to do at least five more. 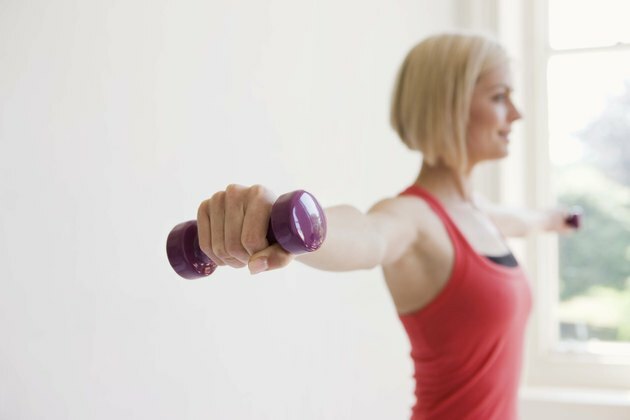 Begin standing straight, holding one dumbbell in your right hand. Bring your left leg forward about two feet, distributing your weight evenly between the heels of both feet. Bend forward slightly, keeping your back straight. Place your left hand on your left thigh to support your back and pull your shoulder blades together, drawing them down your back. Bend your right elbow 90 degrees, tucking it close to your ribs. Your forearm should hang relaxed from your bent elbow. Slowly begin to straighten your elbow as you exhale. Keep your upper arm and torso still. Begin to bend your elbow as you inhale, bringing your arm back to the starting position. Repeat 10 to 15 times on your left and right sides. Relax for at least a minute and repeat. 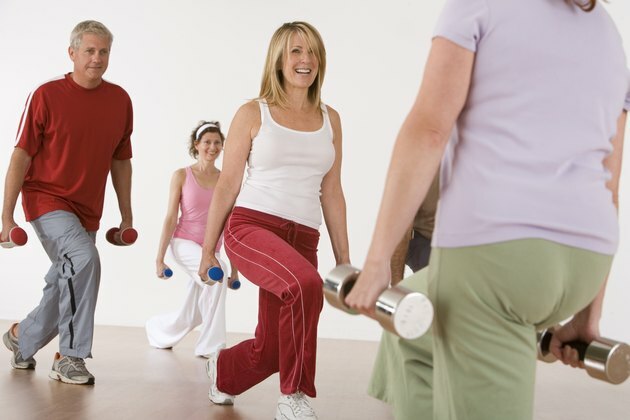 Do at least three sets of 10 to 15 repetitions two times a week to tone your triceps. Select your weights. Choose weights that challenge you but enable you to do at least 20 repetitions with the ability to execute a few more if you wanted. Grip one dumbbell in each hand. 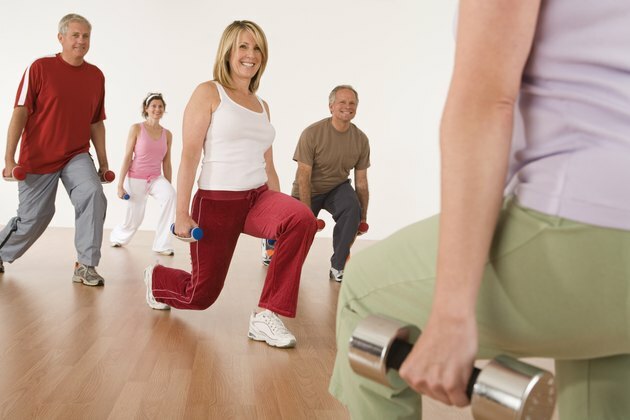 Bending over slightly from your hips, draw your weights in front of your thighs, keeping your elbows slightly bent. Keep your knees slightly bent to protect them from injury. Raise your upper arms slowly to the side. When your arms are at shoulder height, stop for one second. 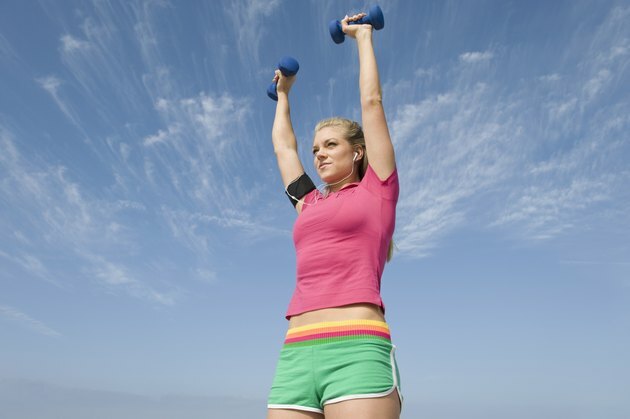 Your body should look like a "T."
Lower your arms slowly. Repeat 10 to 15 times. Complete at least three sets with one minute of rest in between each. 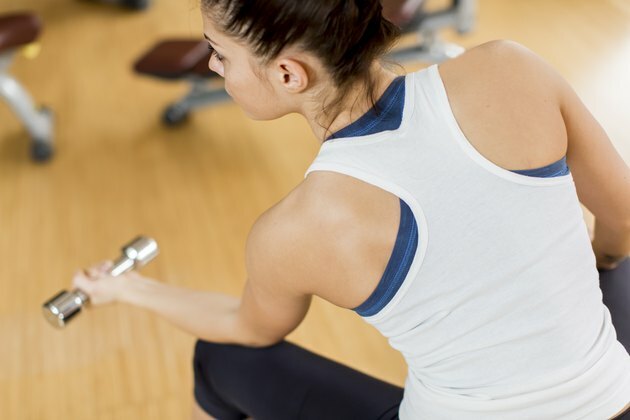 Aim for doing shoulder raises at least twice a week to tone your shoulders without bulking up.